The Pin and Pull RPO Ebook. ​You'll always have the chalk last when you're running the Pin and Pull Scheme. Defenses can never be right. You will always have the perfect play called when you run the Pin and Pull RPO. If Defenses gear up to stop the Run then you will hit them with the Pass. If Defenses drop back to stop the Pass then you will hit them with the Run. Block Any front the defense gives you. We go over how to block the Pin and Pull RPO against an Under Front, Over Front, 50 Front, Stack Front, and Bear Front. Your players will never be surprised by what the defense comes out in because you have schooled them in their simple blocking assignments. Burn defenses with the pass. Defensive Coordinators putting everyone in the box to stop the run? Good. You're going to go deep with the two best Air Raid Play-Action Passing Concepts: Y-Cross and Y-Sail. One of the most comprehensive books on the Pin and Pull schemes. Coach McKie puts plenty of window dressing steps, schemes and a ton of knowledge into this book. How to block against different fronts. Is the defense in a Over Front? Under Front? 50 Front? 3-3 Stack Front? Bear Front? It doesn't matter because your players will know how to block each one of them. Want to know the best RPOs to pair with the Pin and Pull Scheme? Good. Because we cover Comet Screens, Pick RPOs, Snags routes as well as when to call them during the game. Afraid to run RPOs because you don't who the quarterback is keying? No problem. You will learn the simple way of teaching your quarterback who to key regardless of what the defense lines up in. Defenses will go Man-to-Man once you gash them several plays in a row while running the Pin and Pull RPO. Do you have the answers to punish them? Coach Ron McKie has been coaching football for close to a decade. He has coached on both sides of the ball, so he knows what drives defenses crazy. His offenses have set multiple school records in points scored, touchdowns thrown, yards thrown, yards rushed, and more. 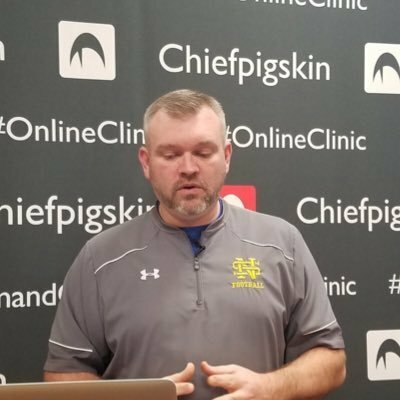 Coach McKie runs a successful podcast - Talking Football with Coach McKie - as well as a popular YouTube Channel. He has been helping coaches across the world Master the Spread, Score Points, and Have Fun! A Fully Updated eBook to the most devastating Run Scheme in Football. How to block the Pin and Pull RPO against ALL FRONTS. How to DRILL the Pin and Pull RPO. Two Air Raid Play-Action passes that destroy defenses looking to stop the Pin and Pull RPO. Why you need to use MOTION to window dress the Pin and Pull. Why Wait? Score Points Now.